Heat oven to 350°F (180°C). Remove half of cookie dough from wrapper; refrigerate remaining dough until needed. On lightly floured surface with rolling pin, roll half of dough to 1/4-inch (6 mm) thickness. With 3 to 3 1/2-inch (7 to 8 cm) cookie cutters such as diamonds, heart or star, cut out dough shapes for birdhouses (or cut desired shapes from dough with knife). Use 1-inch (2.5 cm) canapé cutter or sharp knife to make "door" in bottom half of each. If desired, use drinking straw to make hole in top of cookie for hanging. Place 3-inches (7 cm) apart on ungreased baking sheet. Repeat with remaining dough. For decorations on birdhouses, roll scraps of dough and cut miniature shapes such as trees, stars and other small shapes; do not attach to birdhouses. Place miniature shapes on baking sheet. Bake 7 to 11 minutes or until set (bake small shapes about 7 minutes). Carefully remove from baking sheet; place on cooling rack. If necessary, repoke holes for hanging. Cool completely, about 20 minutes. To decorate cookies, use frosting to attach small shapes to birdhouses. Attach pretzels for roofs. Cut each toffee candy into 4 lengthwise pieces; attach 1 piece with frosting below door to resemble perch. Use vanilla frosting to make snow on roofs. 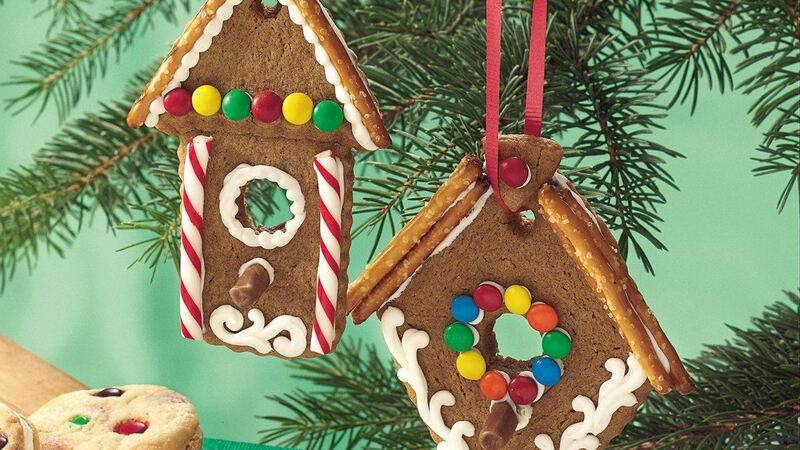 Use decorating gel and candy-coated chocolate pieces to add decorations to birdhouses. Kitchen Tip: Tip: Children can design their own birdhouses and use them as ornaments. You'll want to use a straw to make small holes in the top of the unbaked cookies. When cookies are baked and the decorations have set, pull a ribbon through each hole and tie to hang as an ornament.